About Makeup Base, the most important part of doing makeup, I say. When we talk about full coverage makeup, pancake makeup comes to our mind just at the beginning, no? If you do it wrong your whole effort gonna be a disaster. Only because of my reader’s request I thought to post regarding makeup base. And I decided to do it in 3 steps. Today’s post is about the Heavy base. What I do mostly is kinda basic. Which is suitable for daily basis or might be ok for a party. But when it’s come to heavy makeup like bridal or photo shoot, I’m totally premature! So that, I was kinda experimenting with those kinda makeup in our DESI style, what I mean is what our local beauty salon does usually. Start with a clear n moisturized face (my naked face, the ugly face of beauty). First, apply a good amount pan-stick directly. There are a lot of varieties pan-stick available in the market but I’ll suggest you Kryolan TV paint stick. Because it gives the most desirable coverage and shades, last long and moisturizing. Blend it with a damp sponge and blend it well. The best thing about using pan-stick is you won’t need and concealer. All your imperfection will disappear only by this. Then spray a good amount of water on your face and let it dry. Spray water all over your face again. Now take your skin color and yellow color pancake and mix both with a damp sponge to get the desired shade. Dab the sponge carefully in your face creating a heavy and even base. Make sure you blending everything evenly. Then, take the brown pancake and mark the contour line, On your chic bone, nose, hairline and lower chin. Now, apply translucent powder all over and spray a good amount of water, again on your face. When the water is almost dried out but still the base is slightly wet, take your previously used sponge and dab it all over and blend everything nicely. And, your heavy base AKA Makeup With Pancake is ready to Rock! You can now jump on to do other things like eye makeup or whatever! You might find this kinda base a bit cakey at the beginning, don’t be terrified! It takes time to set with skin oil. Within half an hour the base will totally set with your skin and won’t look cakey. However, there is one more thing. Usually, people tend to get way too white shades(I mean way lighter than the skin tone) of pan-stick and pancakes. Which causes cakey and cat face. Always try to pick a similar shade that is closest to your skin tone. I used a shade dark pan-stick and pancake here than my skin. When the shade is mixed with yellow it turns into my skin shade and it surely gives me a more natural look. This is a super heavy base actually and kinda waterproof makeup. This type of makeup is best suitable for working under high-volt of light. Makeup With Pancake is totally not suitable for your everyday life and not really good for your skin either. In fact, the world has changed and the processed base makeup have developed quite a lot. We prefer a healthy, dewy, no-makeup makeup look nowadays, no? If you’re expecting that you’ll get such glowy makeup with pancake, especially in a Desi Makeup Style then I’m afraid, forget it. Makeup with pancake only gives you a matte, solid and long-lasting makeup-looking makeup! You gonna have a hard time if you wanna wash off pancake makeup only with soap and water. My advice, take a wet tissue and soak it with baby oil/olive oil, wipe off first. Then wash your face with face wash, twice, even thrice! Might do your regular exfoliation afterward. Lastly, don’t forget to tone your face with toner. Hope this post gonna help you! I literally had no idea how to do this sorta tutorial post properly. I tried, hope it’s okay!? You can’t imagine how hard it is to make a pictorial. Taking an own picture by ownself… grrr!!! and when most of the time I get a blurry pic! ..any advice from your side? Apu panstick ta ki 1 shade darker and cake ta 1 shade lighter hobe? Sorry last pera ta bujhte parini. And parle please make a video tutorial. nah, all same like skin tone hote hobe. Last pera te bolechi je skin er cheye shada panstick/pancake use korle makeup cakey lagbe. Panstick or Pancake er shade ektu bright korte chaile ektu yellow shade er pancake mix kore nilei hobe. apu plz let me know which brand of pancake u prefer ?? how do I match my shades?? my skin tone is nc 44 may be. Proma, pancake Ami jokhon use korechi tokhon shudhu gopinath r r ekta ki jeno paoa jeto. Egula pictur e shob gopinather. Ekhon gulshan e kryolan paoa jai shunechi. I suggest you use that. Ktyolan is a good brand Jodi original ta pao. How you doing sweety? Im loving your blogs, they’re amazing!!! Im actually from the UK and i love how makeup is done in Dhaka i love the smooth flawless base done at the palours, its not the same here:( The professional pan-sticks & pan-cakes they use at the palours what brand is it and what shades? And how can i get hold of them from uk? thanks for taking interest in my blog. There are so many local brands available in Bangladesh. Im afraid you can’t really get them in UK unless you visit BD and buy in person. However, you can definitely try some renowned brand like Kryolan and i believe they are somewhere available in Uk or they ships there. Do browse cryogen site for infos you need. appi 4 ta pancake ar 3 tar use dekhlam….but tomer skin thake lighter pancake ar bebohar khuje pai ni….oita kokhon use korbo??????? you are just too good!! may i know which shade of kryolin did u use in your 2nd pic? But want to know that i use pancake shade 23 which is may be 1 shade lighter than my skin. as u used 4 shades 26, 27, 30 and yellow just want to know which shade matched with ur skin & why should we use those?? api pancake i use 23 which is may be 1shade lighter than my skin. as u used 4 pancakes together 26, 27, 30 and yellow which no is matched with your skin colour?? and let me know about others plz. why should we use those?? and for me which no. is appropriate??? 26 is almost close to my skin color. 27 is dark.. my skin tone is yellow so to get the exact color i had to mix those three. kryolan tv paint stick ta apni kotha tkeke kinesen? Kryolan TV paint stick ta apni kotha theke kinesen? apu panstick use krar por jodi only face powder use kori tahole ki seta valo hobe?r tmi kon translucnt powder use kro? panstick ta thik moto set korar jonno pancake ta lage. 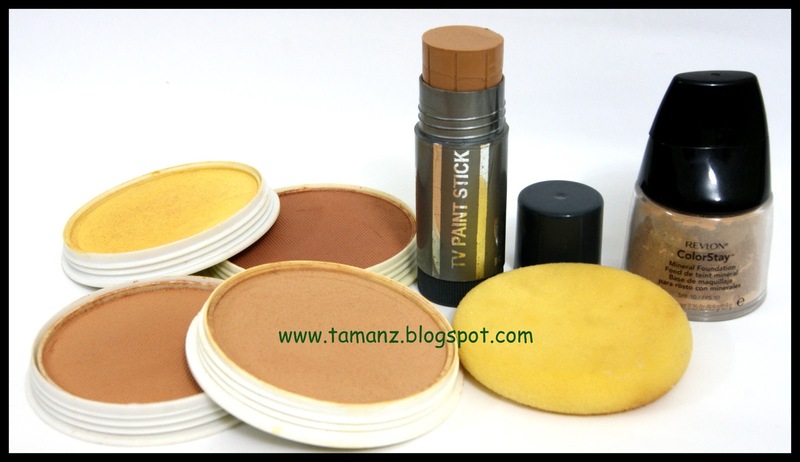 i’ll not suggest u to use panstick for everyday make up.. its to heavy to wear !!! U can use any translucent powder but mac studio fix wont be suitable because its a foundation along . N studio fix wont set with water, where panstic/pancake must need a good splash of water to blend n set. Highliter pancake na kine some good powder/cream/shimmer kino better hobe. thanKs dear……..onk help hoise ai post dakhe but kryolan tv paint stick Almas pau jabe???? price koto?? Almas e ache kina bolte parina ! You are soo sweet. What an easy description. Ki shundor Description. Yumi khuub e valo. BTW, What shade no. do you use, just for the reference? I LOVE you…. I LOVE you….I LOVE you…. I LOVE you….I LOVE you…. I LOVE you….I LOVE you…. I LOVE you….I LOVE you…. I LOVE you….I LOVE you…. I LOVE you…. Ami besh kichu professional ke onekdin bolechilam, keu e amake help kore ni apu, BUT tmi …. ufff,,,, just THANKS…. ..n yeh it’s a tough job to find the right shade . Try match the shade with upper side of ur hand .